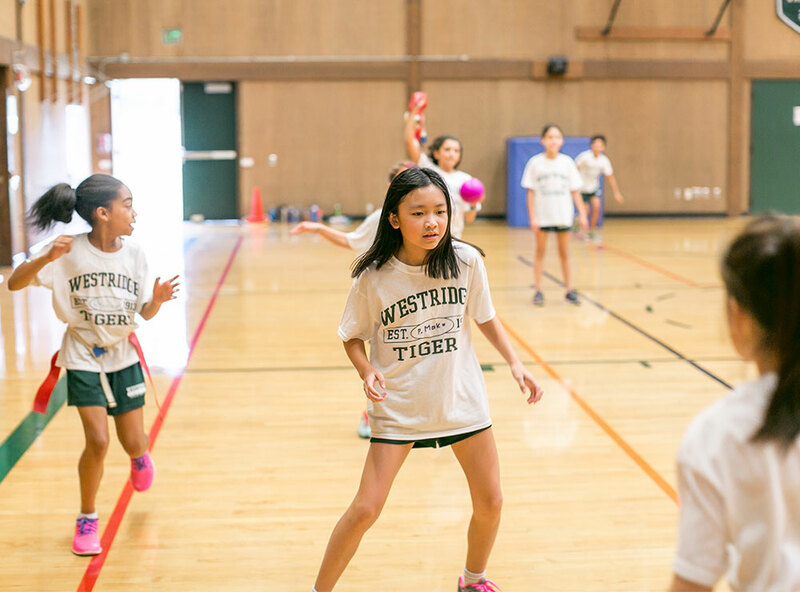 Westridge supports girls in leading physically active and emotionally healthy lives by offering a variety of activities and courses appropriate to developmental levels within each division. Our program encourages reflective, mindful, and deliberate engagement with each other and the community. We also give girls the tools they need to engage in ethical decision-making that values diversity of all kinds. We inspire them to lead compassionate and committed lives by forming nurturing relationships based on mutual trust and respect, for both other people and the natural world. Learn more below about how we promote physical and emotional wellness in our programs. In the Lower School's daily physical education program, we introduce girls to the fundamentals of traditional sports, cooperative games and activities while emphasizing the importance of health and cardiorespiratory fitness. Through the human development program in Lower School Council, girls also gain confidence to express themselves by learning conflict resolution strategies and tools for building and sustaining friendships. Middle School girls are actively engaged in a comprehensive physical education program that includes four distinct areas of focus: team sports, fitness & recreation, dance, and yoga. Our goal is to instill enthusiasm and motivation for lifelong participation in physical activity as each student explores her unique physical interests and strengthens her abilities. Athletics is offered as an extracurricular activity and affords all girls the opportunity to be a part of a competitive sports team. In Middle School's Human Development program, students learn about issues that impact their social, emotional, and physical lives, in and out of school. Each Upper School girl has the opportunity to be a part of our Athletics program. Novice participants can play sports in the Frosh/Soph and junior varsity levels, while varsity athletes participate in the prestigious Prep League. Girls may also apply for the Physical Education equivalent credit option if they are at advanced performance and competitive levels in their physical pursuits. Through Human Development, Upper School girls are engaged in a carefully scaffolded program of social, emotional, health and college-related topics that respond to age-appropriate concerns with increasing sophistication over time. These courses guide students through Upper School and provide a foundation for self-awareness and personal growth.